Hello you lovely readers and welcome to this weeks Read With Me. I want to start off by saying that this will be the last one of 2015. I have loved reading all of your posts this year and I want to say a huge thank you to everyone. Both new and regular linkers, it has been a pleasure having you come back week after week. I've found so many new books for both myself and my children to read. However I am in need of a break. So I have decided to take a couple of weeks off from blogging. I do hope to be back with Read With Me in 2016. But for now let me tell you my final favourite post of the year. It came from the lovely Story Snug talking about her Advent Calendar. Some wonderful book choices, not only for Christmas but for all year round. Onto the link up. 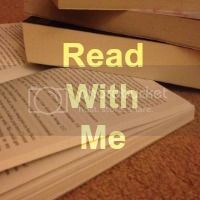 If you are new do take a look here at what Read WIth Me is all about. Regulars, get linking, commenting and hopefully displaying my badge. Hooray for taking a Christmas break! I want to thank you for hosting this linky; it's encouraged me to read more so that my reviews can go live on a Monday morning to link up! Thank you for hosting and letting me link up some strictly not book reviews! Have a lovely break!